Beautiful packaging can make the most simple gifts extra special. 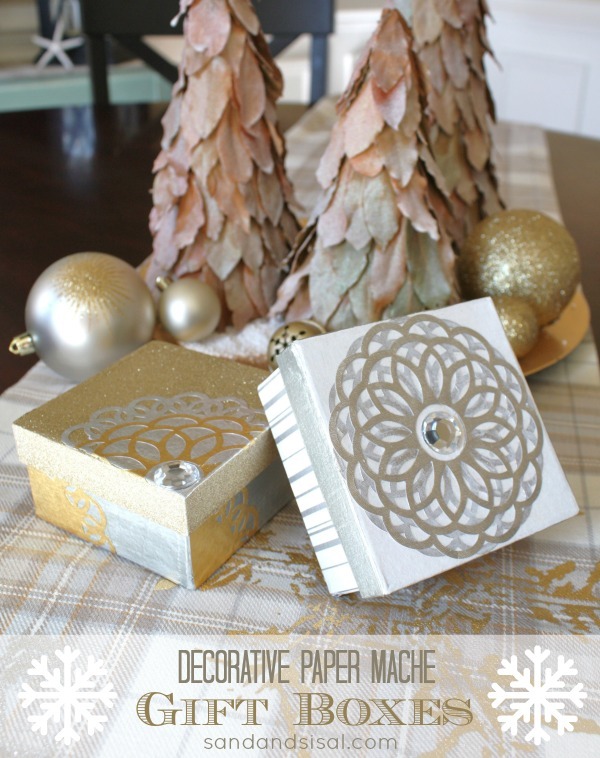 This holiday season, whether the gifts are for Christmas, Hannakuh, hostess gifts, place settings gifts, or stocking stuffers, consider making your own Decorative Decoupage Paper Mache Gift Boxes. I’ve had the fun opportunity to sample and play with the new Mulit-Surface Decoupage collection from Martha Stewart Crafts. 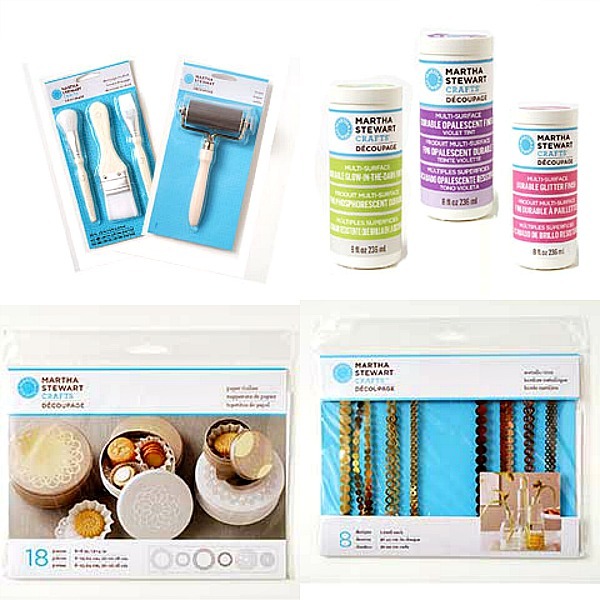 The collection is comprised of craft paints, glass paints, decoupage finishes, and jewelry. What is most impressive is that these multi-surface paints and decoupage finishes are DISHWASHER SAFE! You can decoupage glass and ceramic like never before. (Get ready for several awesome craft ideas coming soon from me!) But for today, we’ll focus on these beautiful little gift boxes. 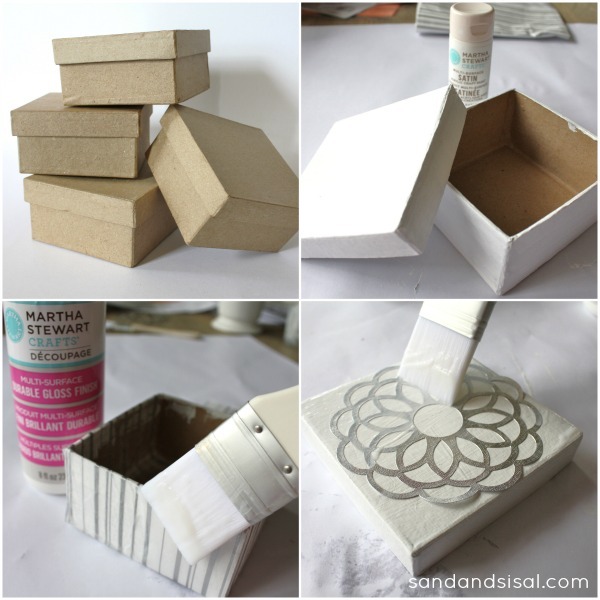 Step 1) Paint the paper mache boxes with either spray paint or Martha Stewart All Surface Craft Paints. Allow to dry. Step 2) Cut tissue paper in 2 long strips, the width of the box. Paint a layer of Decoupage to the box and smooth the tissue paper onto the box. Very gently, paint another coat of decoupage on the tissue paper to seal. I used the gloss finish decoupage. Step 3) Coat the painted lid in decoupage (I used the multi-surface durable glitter finish), then place a Metallic Decoupage Doily onto the lid and coat again with white glitter decoupage. Allow to dry. Step 4) For a double flower effect, paint a layer of CLEAR GLOSS decoupage onto the lid and place another Metallic Decoupage Doily on top of the base doily. Only this time position it so that the base doily shows underneath. 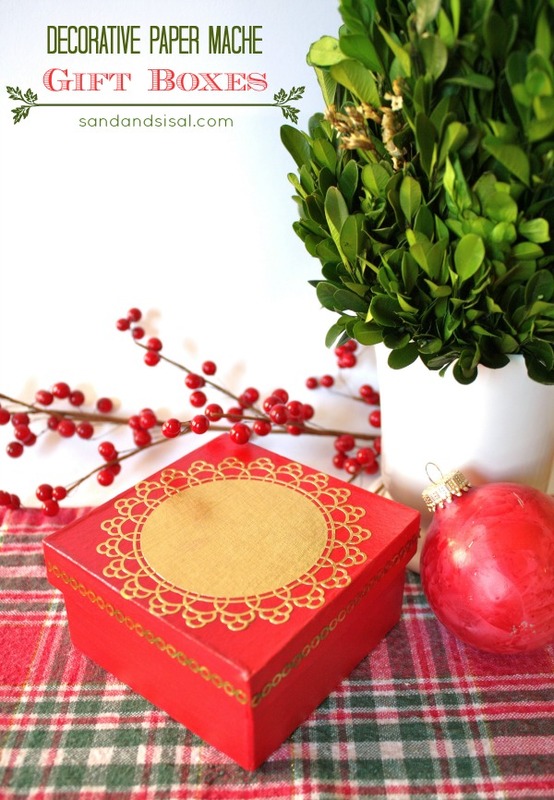 Tips & Ideas: The decoupage doilies come in several designs and sizes, all in one package! 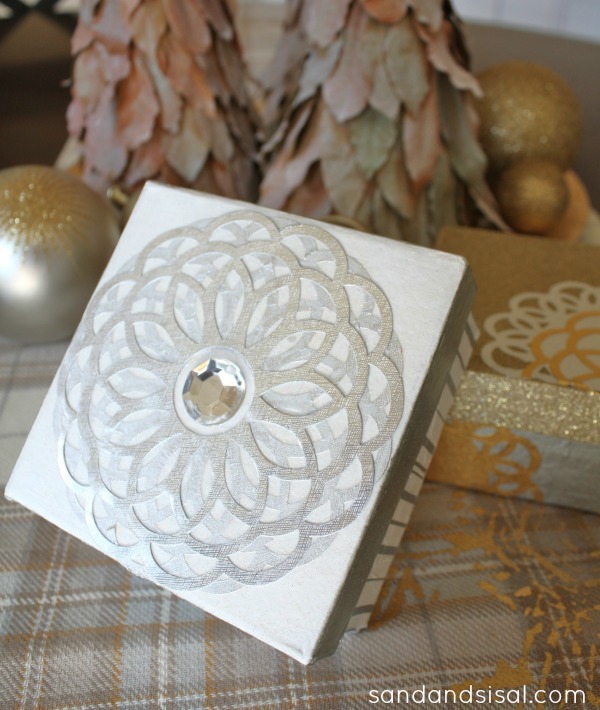 Try cutting the doilies in half or in quarters and use those shapes to decorate the corners of your boxes. Mix and match silver and gold together for a festive holiday look. For the silver and gold box below, I coated the lid in gold spray glitter and painted the box base in Martha Stewart Multi-surface Paint in “Sterling”. it is a very shiny paint and one of the best metallic paints I’ve ever used! And best of all, they are multi-surface paints. You can paint glass, ceramic, plastic, wood, paper, metal, etc and they even hold up in the dishwasher after curing! I’ve already used one of my gift boxes for my mother’s birthday. She was ooing and ahhh-ing over the box and was surprised that I told her I made it from a boring paper mache box! (Plus she loved the gift inside!). 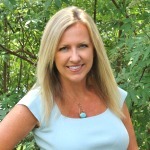 Connect with Plaid & Martha Stewart Crafts on Facebook, Pinterest, or email newsletter. 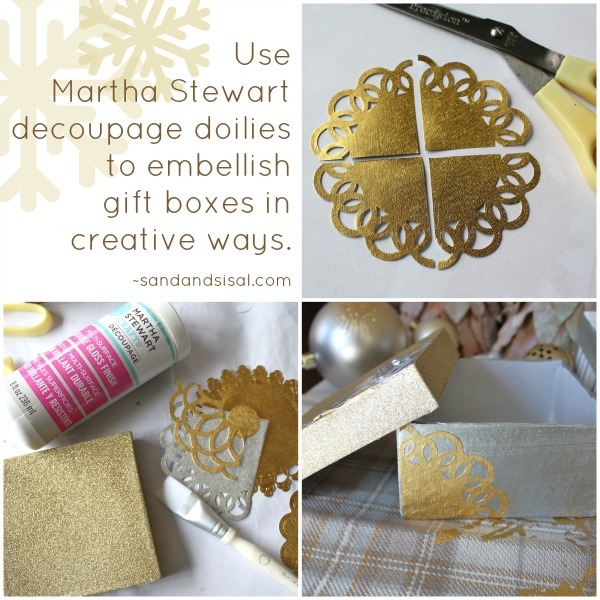 Here are more beautiful ideas using Martha Stewart Crafts that you can check out. This post was brought to you in sponsored partnership with Plaid/Martha Stewart Crafts. All ideas and opinions are my own. Hee, hee, why thank you Jess! These boxes look fabulous! A simple idea, and not much work at all. Super craft for the holidays (even the older kiddos could have fun with this). Thanks for the inspiration. Those are bee-u-ti-ful Kim!! I always love it when the box itself is a gift! Think I could get away with not putting anything inside them? 😉 LOL!